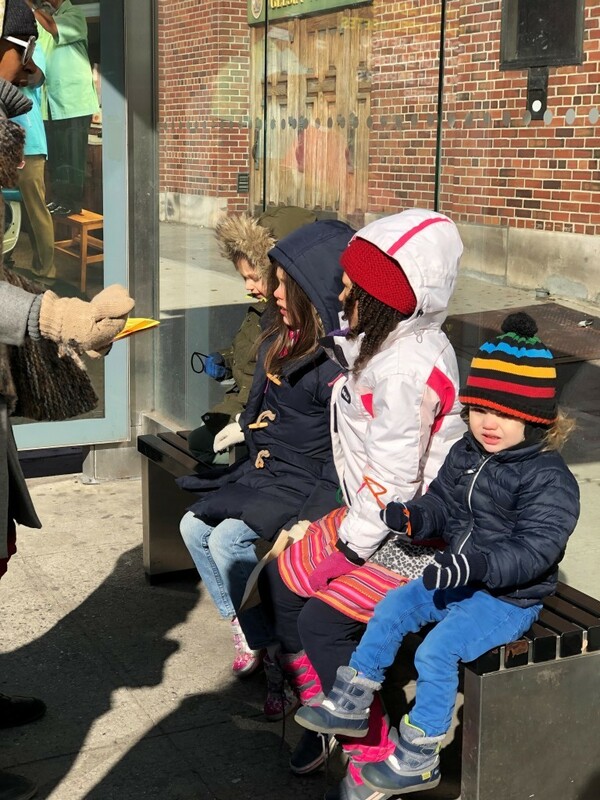 On a blistery, cold but sunny morning in Brooklyn, Future Planners organized a Walk & Talk Tour™ for a group of children (and their parents). 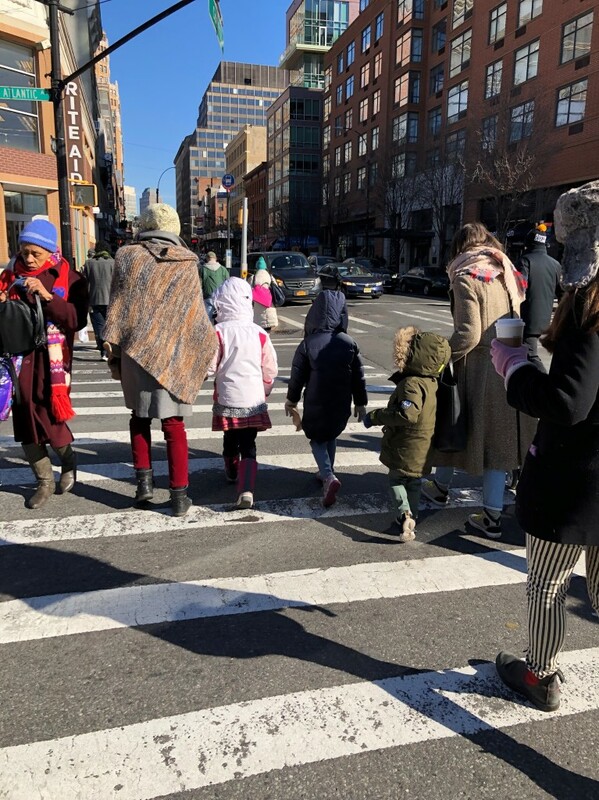 These energized kids took to the streets to voice their thoughts on the cityscape that surrounds them daily. 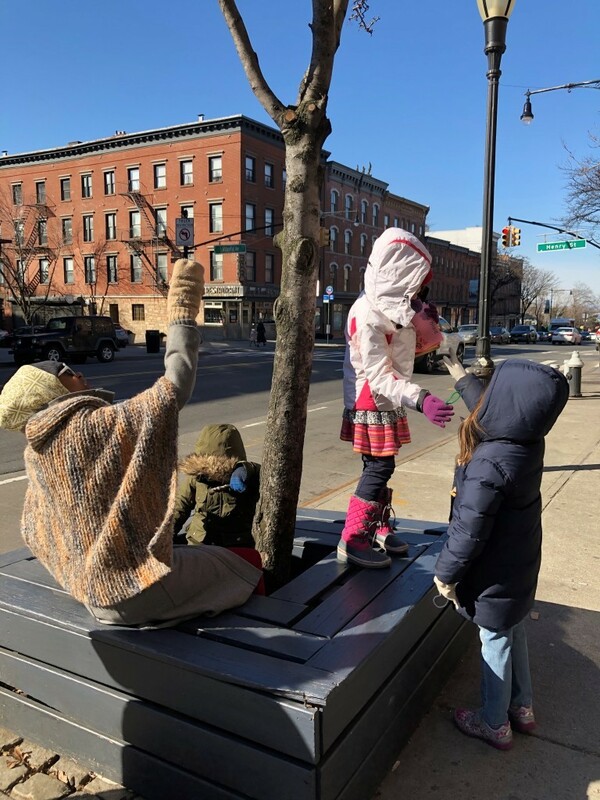 From two to seven years old, they shared their thoughts on what they like and dislike along Atlantic Avenue, a street that three centuries ago started as a dirt road which lead to the Patchen Farm located, along the East River. Fast toward to today and Atlantic Ave is one of the most important arteries of the Brooklyn borough. For some this was a new experience, others were veterans of previous Future Planners events and enrichment classes for kids. What they all had in common was enthusiasm and a forthright conviction on their ideas about how they experience their community. Suggestions ranged from updating bus shelter benches to become user-friendly for the homeless, to using bike racks as jungle gyms. Their suggestions fluctuated from fun and frivolous, to politically sensitive. Having children lead adults, sharing their passion for what they see, feel and experience instills an awareness that as young city-zens their voices matter. Small yet powerful events such as these are an important step in creating a sense of civic participation, making our cities more sustainable for all generations. and a brownstone are different, why? A city is most fairly judged by how it invites and supports children into its urban fabric. Children see and experience our cities at shorter heights, with fresher eyes and absorbent minds. 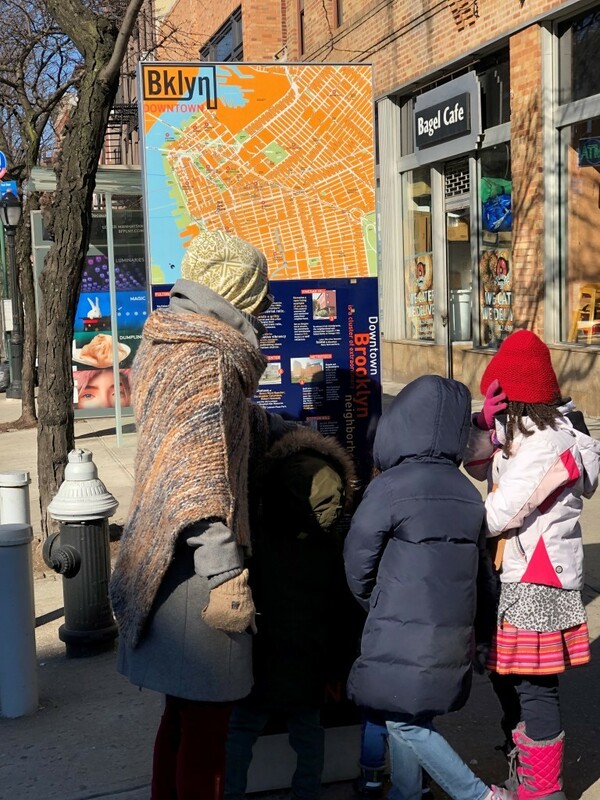 It is our jobs as city planners and adults to incorporate a child’s perspective into our thinking about the cityscape. 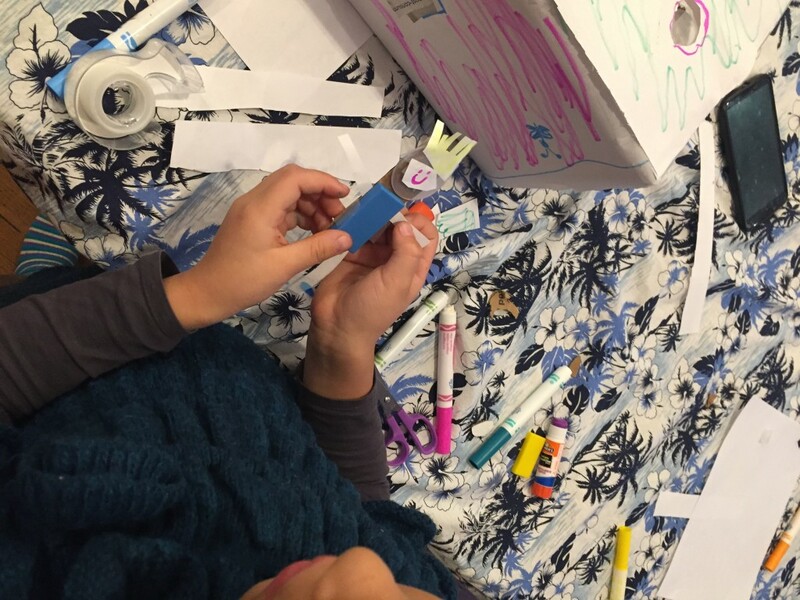 Future Planners* (a company supported by Emerging City) began conducting workshops last spring, with that very intention, to ignite a passion in young children to reimagine the city. The motivation of Future Planners is to reverse the current trend whereby some politicians and planners think of children as an added consideration in city planning, and to instead utilize a youth oriented point of view, blended into city development. Moreover, Future Planners believes that children can become proponents of change, which would benefit everyone. 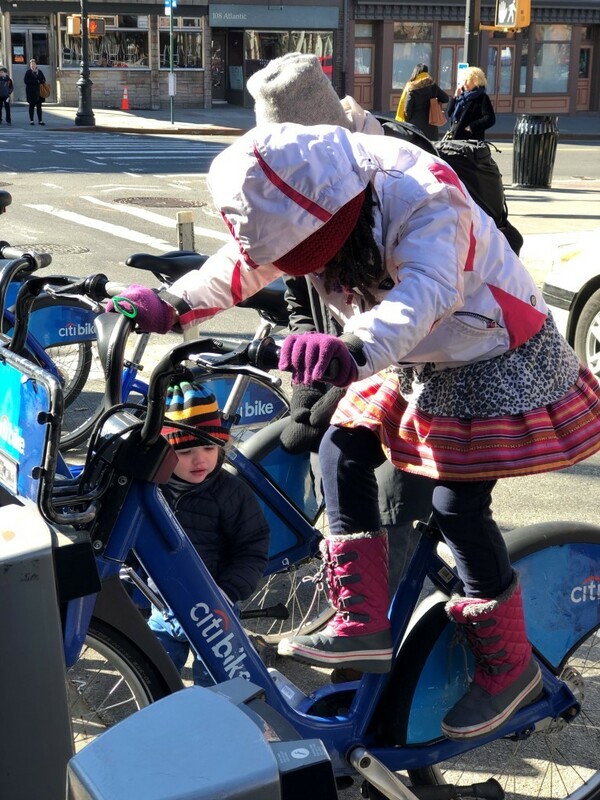 Any metropolitan area that continually balances the considerations of its city-zens of all ages, is a better and safer place for all. So, what happens when children funnel up to adults their creative thoughts and ideas on urban interventions? 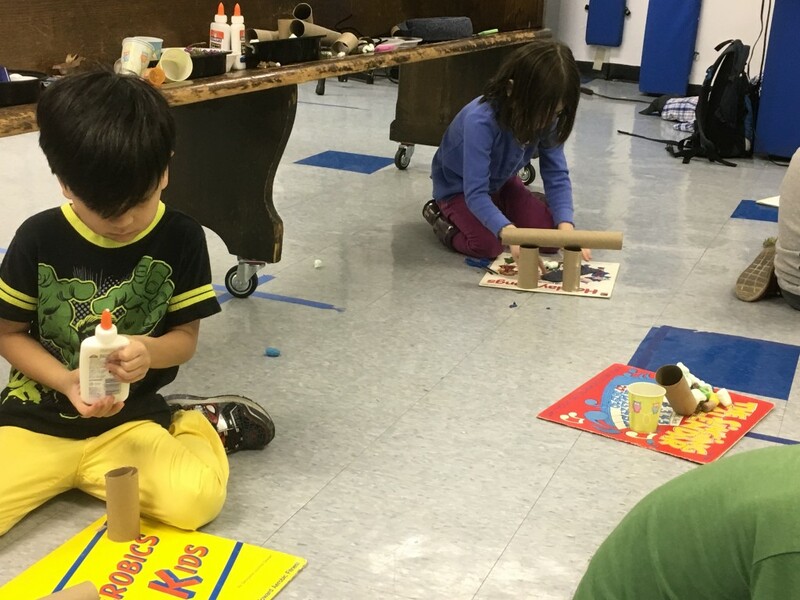 Future Planners conducted a workshop “Plan a Playground” at The Coop School in Brooklyn which motivated students to use analysis, observation and idea generation to create an ideal playground in 3-D models and a mural. And final work product was not the focus, rather it was the creation of orienting children to city planning. Further, the goal was to have children consider “for whom” and “for what” when designing a public space, for residents to use all year round. The children demonstrated great depth and agency at using empathy for others when thinking of playgrounds, from adults who would be supervising their children to pets, these students showed a wide range of brainstorming design benefits for the public realm. Helping our children to “see”, “read” and “feel” our cities, helps them feel a part of their community, reinforces their esteem in that their thoughts are crucial and heard and finally, shows us the adults, the missing piece to ensure our cities are healthy, safe, eco-friendly and joyful places to live. 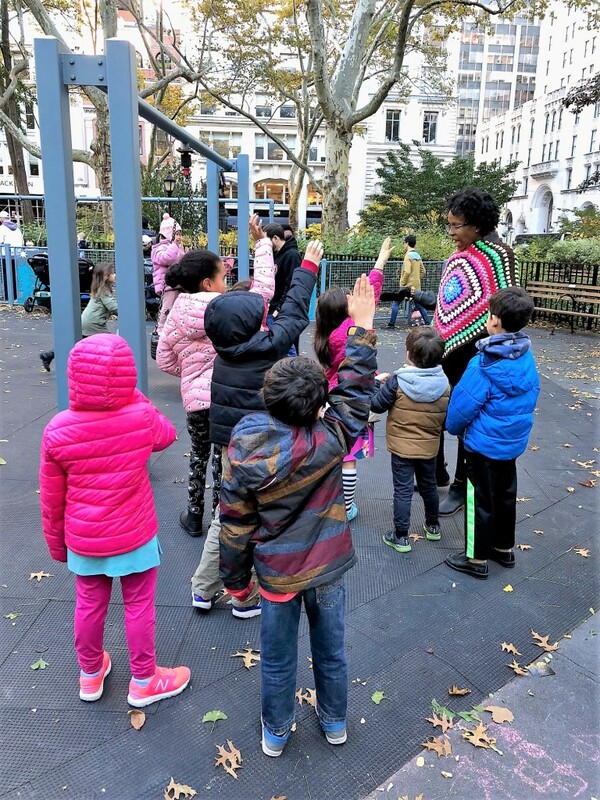 *From workshops and after school enrichment classes, to tailored STEAM curriculum, Future Planners helps children feel considered and capable of having a tangible impact in the evolution of our cities. For further information contact Future Planners. How would our neighborhoods change if a majority of the streetscape were not used primarily as storage for cars? If we want our streets to be ALIVE we have to put people first and reconsider that instead of being co-opted as parking lots for rarely used cars, they could be thriving centers of city life. It starts with a story, a personal story about a public place with a private meaning. In every neighborhood, in every city, there exists a universal truth hidden behind brick and mortar, connections to time and place. What evolves, what remains and what is lost, affects us all. 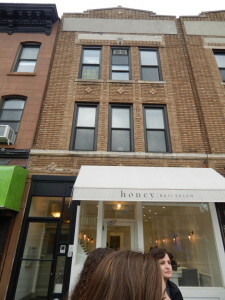 For you personally, what was the motivation for this specific project in Prospect Heights, Brooklyn? How many tours did you do? Did you only approach people that you knew? The work that is the core of this project I started in 2001 when I started asking my neighbors for tours of their Prospect Heights. It was the beginning of my doctoral research, which consists of work I did here and in Oakland. 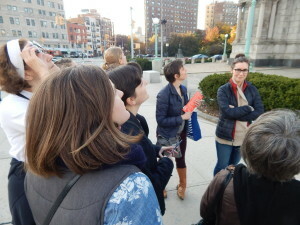 I did 15 tours in Prospect Heights in the early 2000s and I found people for these tours in a variety of ways. Some, I knew but more frequently I would seek out people to introduce me to others that I did not know. I used a kind of snowball sample – different people acted as hubs, recommending other “tour guides” to me, ensuring that I ended up with a very varied group. 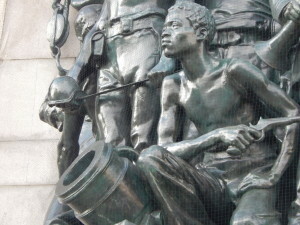 Often these “hubs” were people who themselves connected to a wide range of people. It was all word of mouth. It was a small project and super qualitative. 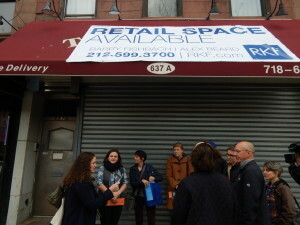 The group of tour guides ranged: people who worked here, lived here, different ages, race, gender and even one teenager. To do the research, I asked people to take me on tours of “their neighborhood”, however they defined it, and I recorded the embodied stories they told along the way. Then I would go back and photograph the places they had taken me to on our walks. Then in a second round I would return to my tour guides with the photographs I had taken of their places, and we would talk further about the images and places. Why would you conduct a second interview? I think the second interview was a really important part of it. Just in the fact that people had a second time to talk and spend time with me, building a trust And maybe people are more willing to talk because I have invested time in them. People liked that I had gone back to take pictures of places that were important to them. These walks captured the sense of the place, as subjects bumped into people that they knew. Bumping up against the reality of the place brings out nuances as you move through the space. The flow of the everyday. Sometimes it is hard to talk about what is actually important to you, other than it being where a person goes everyday. Very frequently there is something larger and significant about these everyday places; these places can be a part of people’s sense of self, the way they relate to other people and even the ways they relate to larger politics. How many hours was this in total, combining the two tours and photography? How much time was invested in each subject? In total on average about 3 hours each that they spent with me, but with some subjects it was much more. 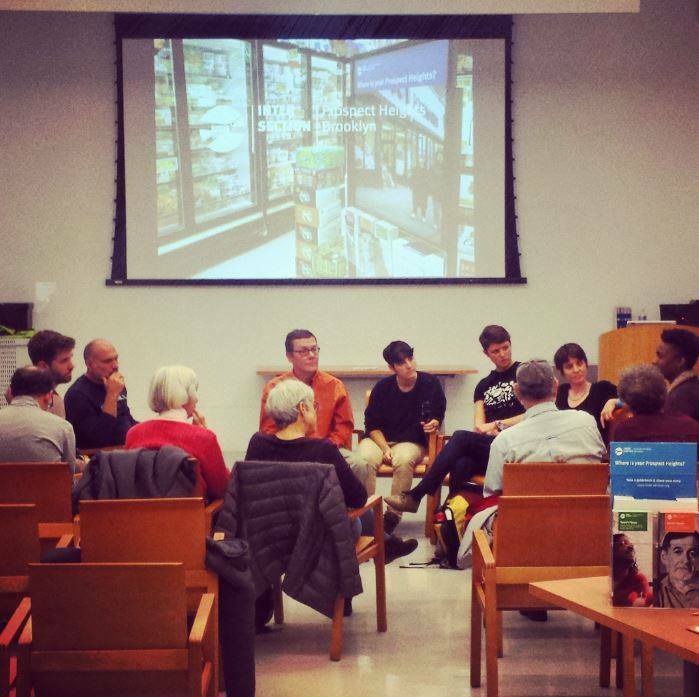 How did the collaboration between you, the Brooklyn Public Library and the Prospect Heights Neighborhood Development Council come together? Was it organic and easy or a lot of work? 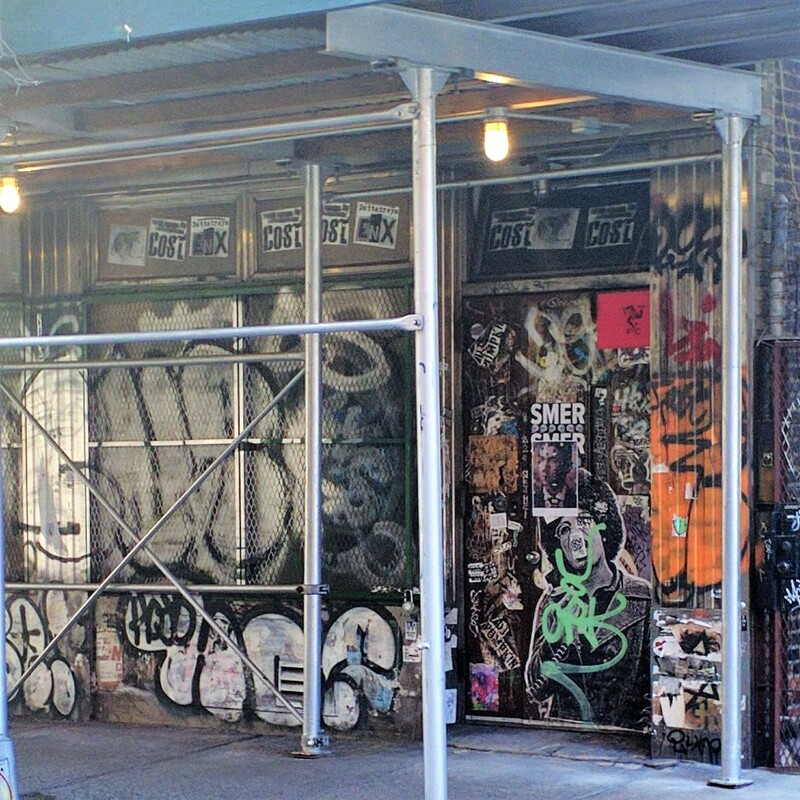 I had always wanted to look for a way to bring this work back to the neighborhood that could be exciting for people to see familiar places and get an opportunity to think about them in a different way. 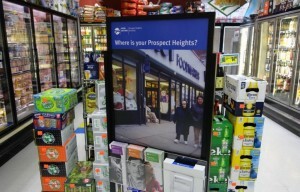 In 2004, Buscada made a short film from these stories and narratives, which was shown in collaboration with one of the first Prospect Heights Neighborhood Development Council (PHNDC) events. In 2014, it was natural to get back in touch with PHNDC to develop Intersection | Prospect Heights together based on our earlier relationship. 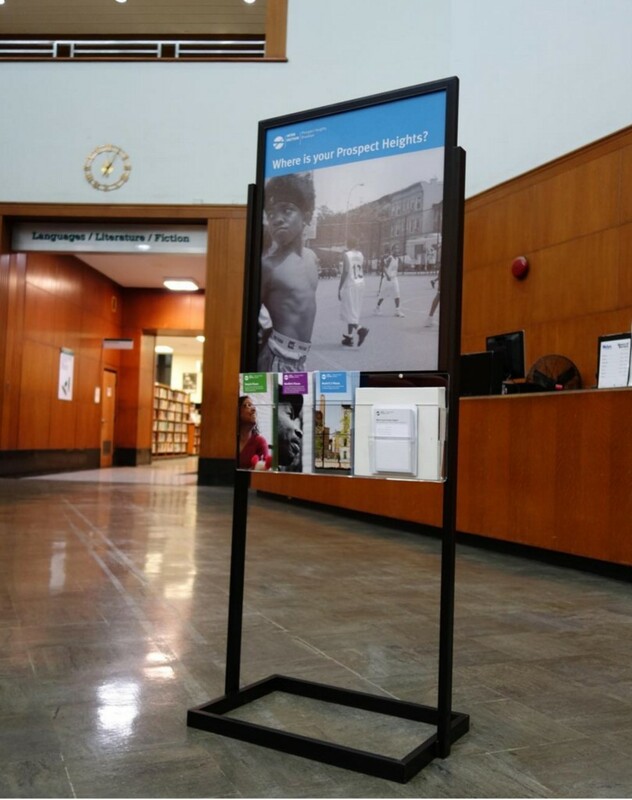 Our partnership with Brooklyn Public Library started with asking for space to give a talk and with their enthusiasm and recognition of shared goals, it grew into much more: hosting public programs, displaying guidebooks of the projects, recording oral histories and connecting with their existing oral history initiatives, and finally, creating an archive in the Brooklyn Collection of the project’s recordings and guidebooks for future visitors to the library. We got grants from New York Council for Humanities, Citizens Community for New York City, Park Place/Underhill Avenue Block Association, Carlton Avenue Block Association, and Council member Laurie Cumbo’s office. These partnerships evolved very organically. What will you do with the hours of audio interviews now being collected from current residents? This is such a rich resource. The Brooklyn Public Library has been very supportive and they will archive the recordings in their Brooklyn Collection. The subjects in the guidebooks, how were they selected? Their stories were collected over a decade ago. Were they chosen with a current time-frame point of view? There were specific stories that had long stood out for me, and that I knew I wanted other people to be able to read. Another aspect was to decide how many stories, and to find the right balance. I was thinking about a number in which you could get a good diversity of experiences. I wanted a cross-section of where people went on their tours with me in the neighborhood and a balance of people who still are in the neighborhood as well as those who have left. Of course, a demographic cross-section of race, class, gender and age was also important. On one hand there is a kind of representative-ness but on the other hand every single one of these people is their own, wonderful, idiosyncratic individual. And I wanted that to come across. How were the guidebooks host locations selected? The large quantity must be a key to the success of exposure. 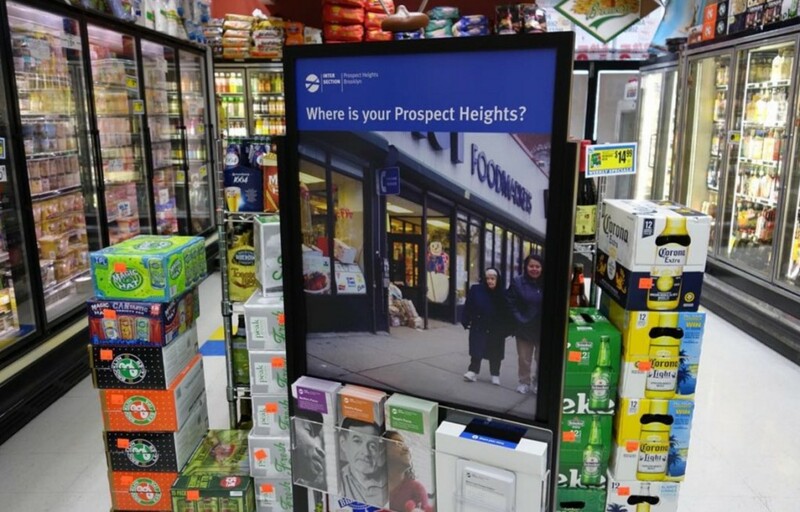 The Prospect Heights Development Council approached individual merchants across the neighborhood to participate in the project, as well as North Flatbush, Vanderbilt Avenue and Washington Avenue merchants’ associations. 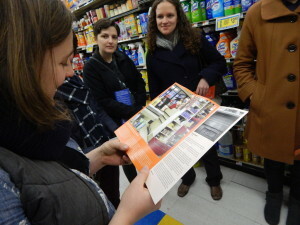 We engaged supermarkets, restaurants, dry cleaners and of course the library, and asked them to host guidebooks for the public to take as well as drop boxes for people’s stories. 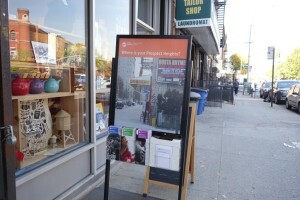 Some locations hosted popup exhibitions featuring large scale photographs of the neighborhood as well. 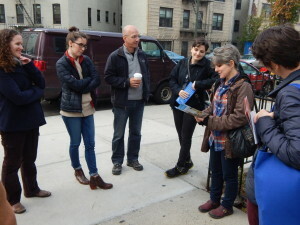 Emerging City also joined one of Gabrielle’s tours/creative walks of Prospect Heights. “When I’m walking past, I see this and it’s just gorgeous. Intersection Creative Walks | This is not a usual tour. This is a tour about stories. 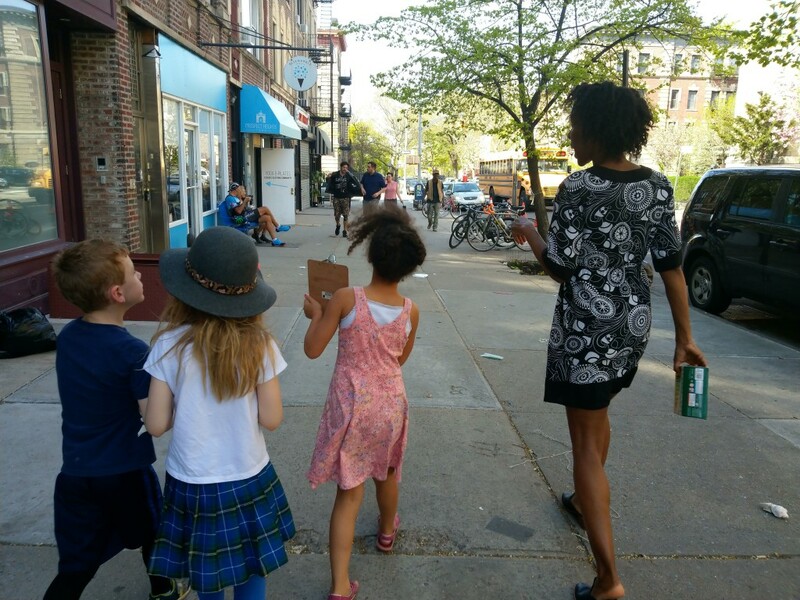 These walks take participants through Prospect Heights, following in the footsteps and reading the words of the people that Gabrielle interviewed and recorded in the early 2000s. 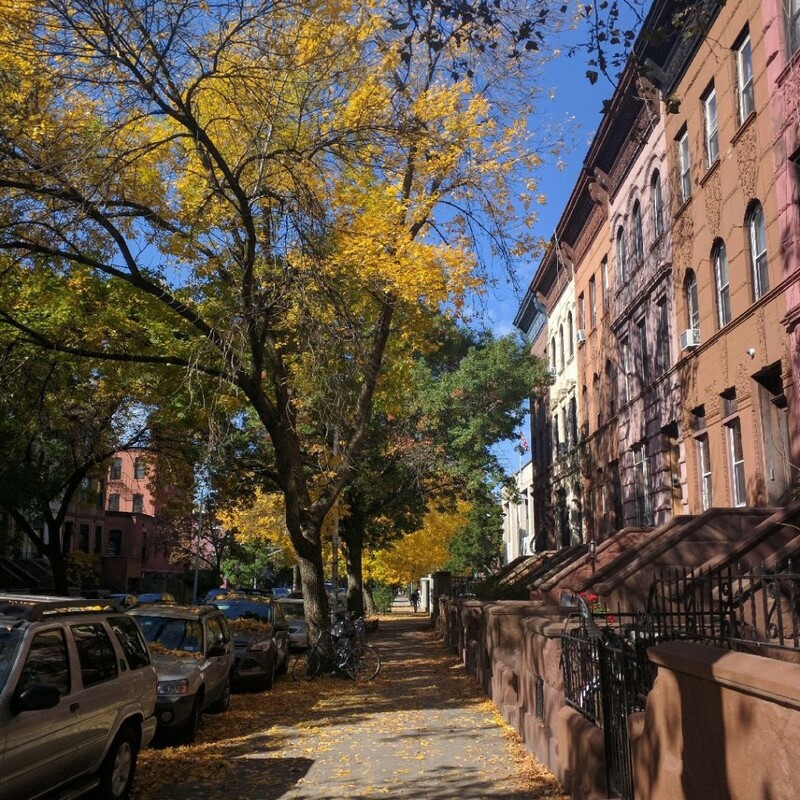 As the physical and social components have changed, she shares that currently there are 19,000 people in Prospect Heights. The African-American and Caribbean population has decreased and the number of $100,000+ per family annual income has increased. In addition 13,500 people are expected to arrive in Atlantic Yards/Pacific Park, the Barclay’s Center housing development, once these buildings are complete in 10 years. 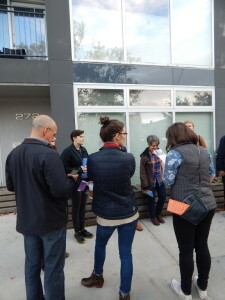 This group tour lets us see how Gabrielle conducted those initial personal tours, which radically changed how she feels about the neighborhood. At the end participants are encouraged to share their stories answering the overarching question “What does this place mean to you?” The tour ends at the Brooklyn Public Library. 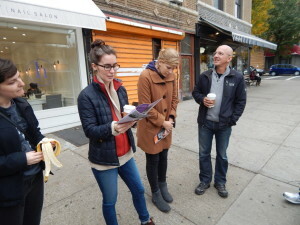 Our tour (the second of two) consisted of 10 total participants with a varying of time of residency in Prospect Heights, from residents of 16 years to only 1 week. The interviews currently being conducted at the library are very open-ended and begin with the question, Where is your Prospect Heights? The interviews are open to anyone. Interviews completed to date have included a range as wide as a resident who has lived in the area since the mid 1950’s, to someone who is moving to the area in the coming weeks. We think this is a positive, as that kind of bipolar feeling and intricate internal and external conflict can only come out in a safe, shared atmosphere. This project has created exactly that. It has built a bridge to learn about someone’s experience and therefore better understand your own through shared stories and conversations. Both may ignite a richer, more inclusive internal dialogue as well. What does it mean when cultural sustainability advances for some while atrophying for others. 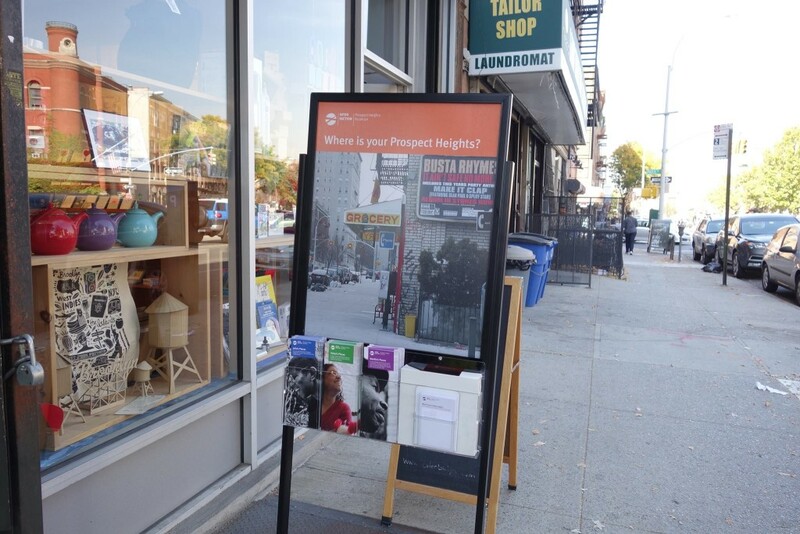 Intersection | Prospect Heights does not assume to pose solutions, yet they take that first critical step in opening a dialogue with the goal of striving towards true understanding. Be open to it evolving. 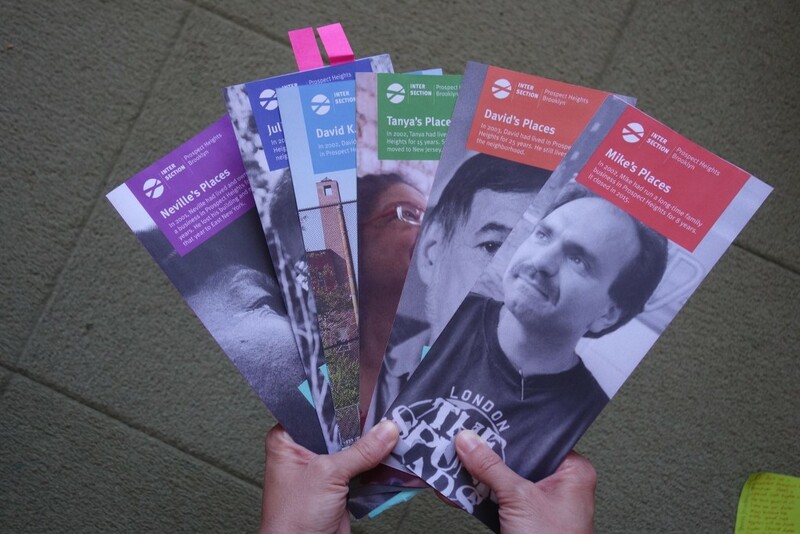 Consider how to use the physical objects of the guidebooks as a way to start dialogue. Make the project open ended. Do a lot of self analysis – ask yourself questions such as are there better ways to engage people? To reach out to displaced people and/or people being pushed out? Each layer is created by days and years, people and movements, politics and community bumping and flowing into and through each other like jazz notes – the city is built in moments, it develops, matures, ages, becomes derelict and is reborn in some small way everyday, through the air, through the streets, through the city-zens. The hillside town of Spoleto, Italy is a challenge to walk. Imagine beautiful continuous, steep hills throughout the historical center. 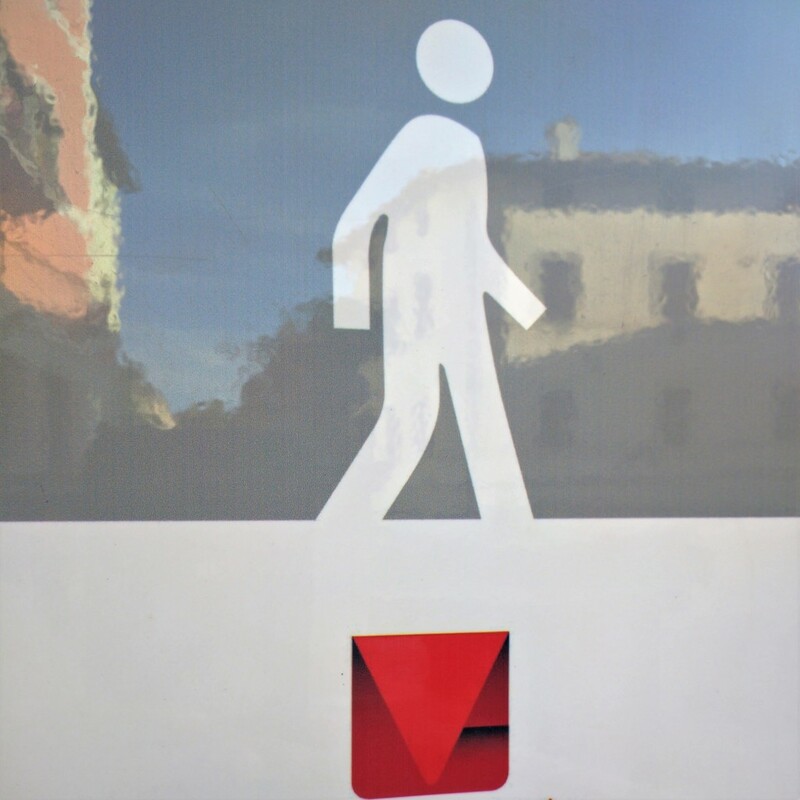 As residents began to abandon the hassles of parking in the older town for the new malls in the peripheral areas, the Spoleto city planning department went to work brainstorming ideas to invite folks of all ages to visit, shop and live in “centro storico”. From 8 to 80 years old, anyone can access and enjoy this Umbrian town by leaving the car behind and going for a walk.